Dr. Kathy Kulba attended University of Milwaukee and Waukesha extension for her pre-medical requirements, before being accepted into Palmer College of Chiropractic in Davenport, Iowa. For the first few years after graduation, she worked at Potisk Chiropractic in South Milwaukee. At which time, Dr. Kathy was given the opportunity to buy an existing practice in Franksville, WI. She practiced for almost 20 years as the Kulba Family Chiropractic Wellness Center. Dr. Kathy has been focused and dedicated to the patients of the Greater Racine area for more than the last twenty years. She is now in Northern Racine County at Caledonia Chiropractic on Hwy 32 and 4 mile road. She specializes in a whole body approach to Healthcare and focuses on establishing a comprehensive Wellness plan in conjunction with traditional chiropractic services. 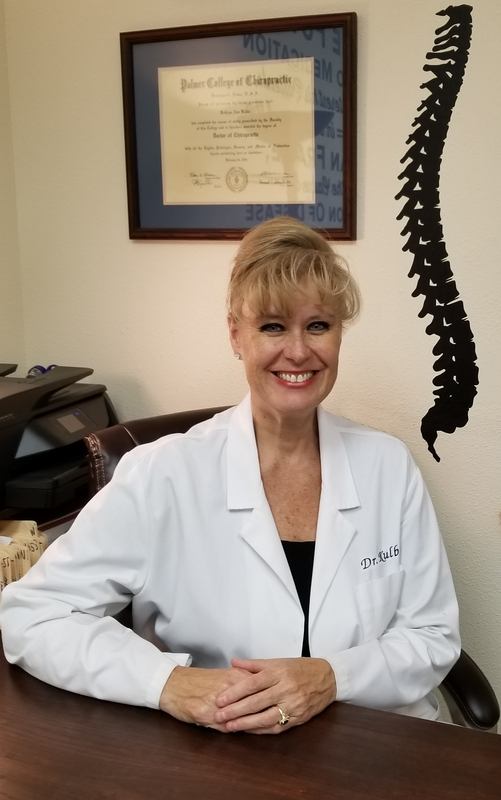 It was during her college years, when she was studying to be a teacher, that Dr. Kathy was introduced to Chiropractic Therapy, not as a student but as a patient. During a summer job, shoveling asphalt on a road crew, she experienced intense pain in her lower back and suddenly she could not move her legs. Her parents rushed her to the emergency room where x-rays were taken and she watched as they put needles into her legs, which she could not feel, to determine what kind of injury she had. The final diagnosis, it was all in her head, nothing was wrong. It was her aunt who recommended that she go and see a chiropractor. Her parents took her and during the evaluation process he insisted that she have standing x-rays, which showed her L5 vertebra was sitting on the nerves to her legs. It was the repetitive motion of shoveling and rotating that caused the spinal abnormality. The chiropractor told her that he was going to perform an adjustment and move the L5 back to where it should be. He realigned the vertebra and she was able to feel immediate improvement and jumped off the table! Since then she has loved going to see the chiropractor. She was able to finish her studies and get her degree in teaching but found a greater calling leveraging her experiences in chiropractic care along with her teaching background . A decision that has allowed her to work towards her life long ambition of helping as many people as she can, for as long as she can, in a job that she loves.